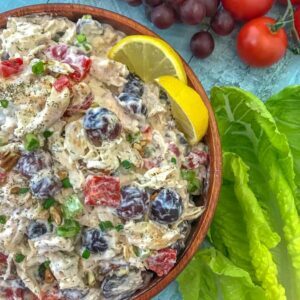 A light and Healthy Garden Chicken Salad recipe that is low-carb, high protein, and full of flavor! A healthy, creamy, full of flavor, and filling recipe that comes together in no time. It makes for a great snack, for meal prep, or as a quick lunch snack. Add this to your next salad, in a sandwich, or serve with your favorite crackers! 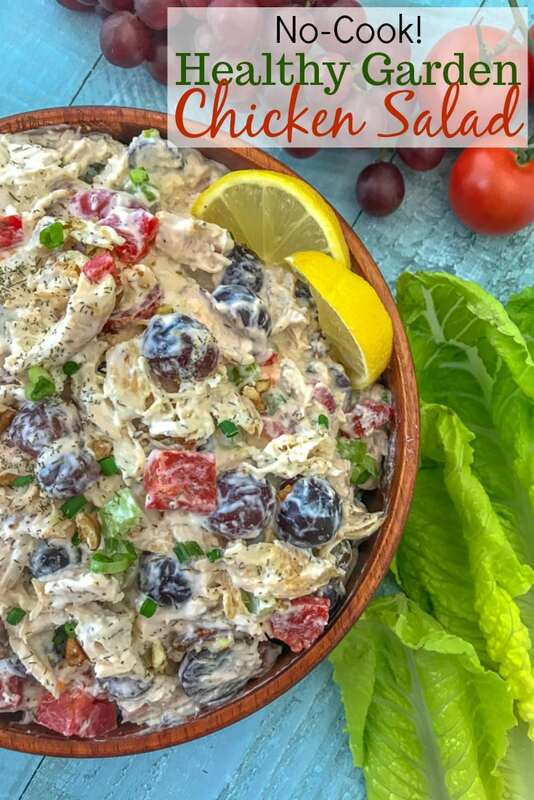 It is also great as a meal prep option – Healthy Garden Chicken Salad Meal Prep! What gets better than a healthy chicken salad that comes together effortlessly, as well as without any cooking required? No washing pans or any extra time spent cooking. This recipe is great for a quick lunch, for hot summer days, or as a healthy prepped snack option. Which I find essential. I firmly believe in (and heavily rely on) having healthy meals, meats, and snacks prepped ahead of time so that when I am tired from a long work day or workout, I can easily grab something from the fridge to eat without having to think or put much effort into cooking. 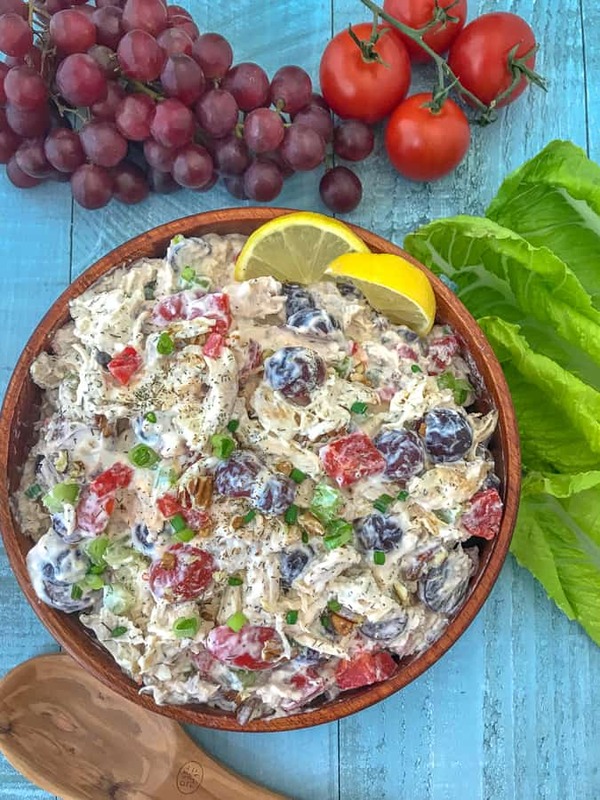 This Healthy Garden Chicken Salad not only hits all of my needs, but fills me up when I need it. Same goes for my Instant Pot Chicken Noodle Soup and Skinny Taco Salad – Meal Prep. Both are very easy to make, healthy and great to have on hand! 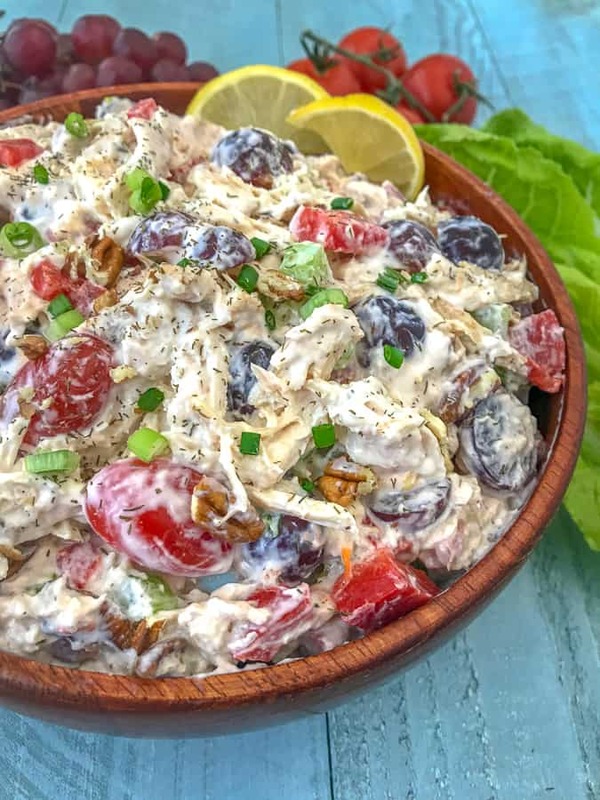 The best part about this salad is that you can use rotisserie chicken or pre-cooked chicken that you have on hand to skip the cooking step! Once the ingredients are chopped and prepped, all you have to do is gently stir them together. That’s it! 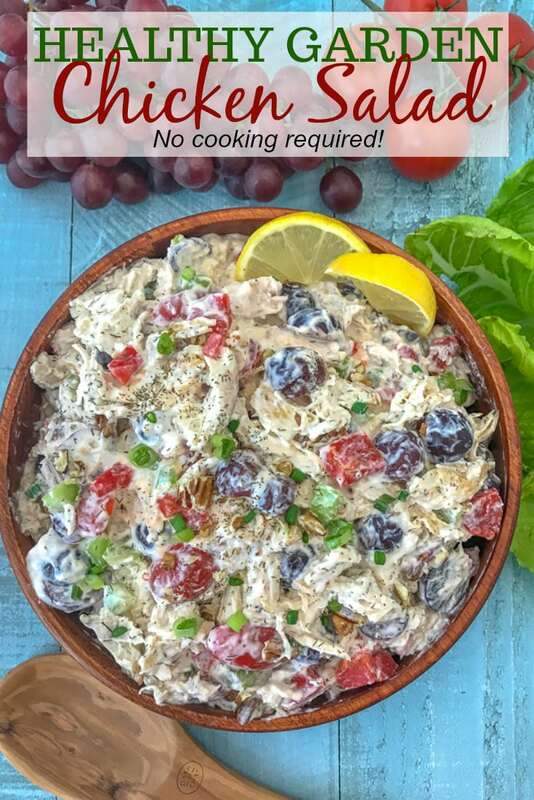 In 15 minutes you will have a healthy, filling and delicious chicken salad to enjoy. MEAT: You can use pre-cooked chicken or rotisserie chicken. Tuna can also be substituted. NUTS: If you don’t have pecans, substitute with slivered or sliced almonds. I recommend adding the nuts prior to eating if you prefer the extra crunch to your salad. Nuts will begin to soften as the salad sits. MAYO: If you’re not a fan, simply omit and add extra plain greek yogurt! SALT: Season with salt and pepper to your taste preference. If the one teaspoon this recipe calls for seems too much for you, start with 1/4-1/2 tsp and add accordingly. SHELF LIFE: I find that this salad is best within 3-4 days after making, which is great for meal prepping. This recipe is MEAL PREP-FRIENDLY! Try it out some time: Healthy Garden Chicken Salad Meal Prep! Healthy Garden Chicken Salad that is super simple to make and comes together quickly - no cooking required! Creamy, crunchy, and very filling. This recipe is great for meal prepping, a quick lunch or snack option, or perfect for a post-workout snack. 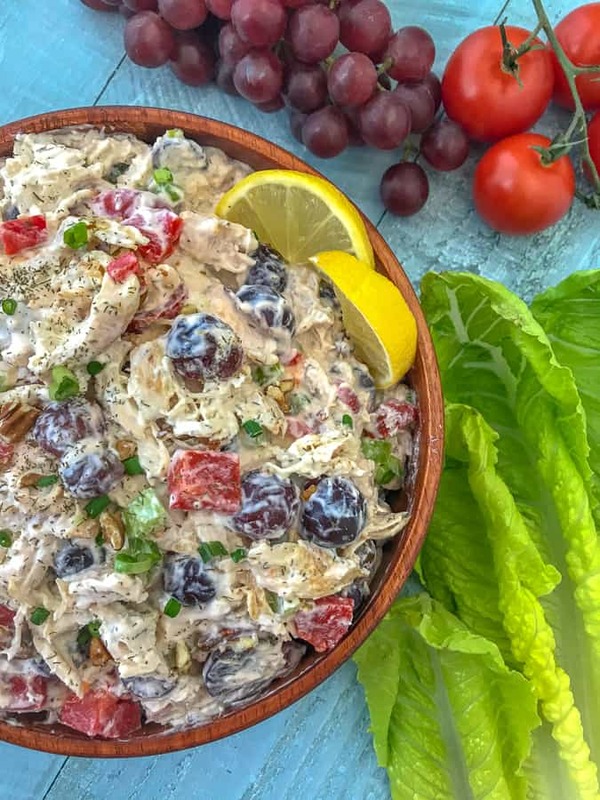 In a large bowl, combine the shredded chicken, chopped scallions, grapes, celery, tomatoes, and pecans. To a second bowl, combine the greek yogurt, honey, mayo, salt, pepper, garlic powder, dill, and lemon juice. Whisk to thoroughly combine. Taste test and adjust the salt and pepper, as needed. Combine the yogurt mixture with the chicken mixture and gently stir to combine. Serve cold over a salad, in a sandwich, or with your favorite crackers. STORE: Refrigerate in an airtight container for 4-5 days. NUTS: If you don't have pecans, substitute with slivered or sliced almonds. I recommend adding the nuts prior to eating if you prefer the extra crunch to your salad. Nuts will begin to soften as the salad sits. MAYO: If you're not a fan, simply omit and add extra plain greek yogurt!